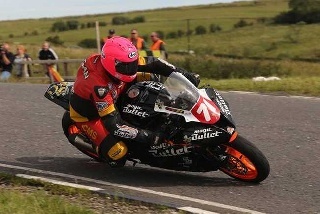 This year will see Saintfield's Davy Morgan take in his 22nd season of road racing competition but, as he explained, he has lost none of his enthusiasm for the sport and will embark on another busy campaign between the hedges. "I have unfinished business at the TT in June after some machinery issues last year," admitted Morgan, who will run his own privateer set-up this season with support again coming from Magic Bullet Motorsports. "I will ride the Magic Bullet R6 Yamaha in their colours in the Supersport class. "We are getting there now and our plans are coming together well and I am fortunate to have four competitive bikes at my disposal, but it takes money to run them and as a team we are still looking for some sponsors to come along and join the team." Morgan, 41, will also campaign a Bumblebee Barn ZX-10R Kawasaki in some of this season's Superstock races at national and international level, and the current plan is to run his own Honda Fireblade Superbike at as many meetings as his team budget will permit. Morgan added: "I want to thank all my sponsors who have stayed onboard for the season ahead and assure them that my desire is to give them plenty to cheer about in 2016." A former Ulster Grand Prix and North West 200 winner, Morgan's goal is to also campaign his two-stroke RS250 Honda on the national scene and also at the Ulster Grand Prix and possibly the Classic TT. This will again come down to budget and sponsorship support. Morgan, who will also benefit from continued support from Strangford Holiday Park, B&H Precision Belting and McBride's Bar, will begin his season at the Mid Antrim in April, followed by the Spring Cup at Scarborough and the Tandragee 100. Well known for his charity fundraising prowess, he will continue to sell pin badges for a various number of cancer charities in 2016 with his fundraising total currently sitting at over £15,000. He concluded: "The TT is the main event and always top of my priority list, but I would love a top 250GP result at the Ulster Grand Prix. I am now one of the most experienced riders racing between the hedges, so I am already looking forward to racing on the roads in 2016."